Earlier this month I spent some time searching The Needles and Indian Creek for ruins and rock art. 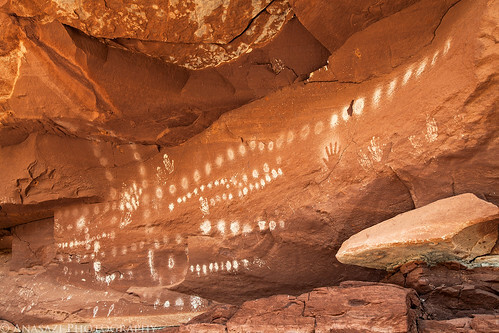 As I searched along Indian Creek, I found this nice panel of white pictographs. Most of it is comprised of white dots arranged in lines that remind me of the panel near Peekaboo Spring in Salt Creek Canyon. There are also a few different kinds of handprints found here.